Reunited with the wonderful Nick and Courtney, we set off to our 'Post La Paz Rehab', Lake Titcaca! It is the worlds highest lake and is absolutley stunning! The views. Our hostel had a balcony overlooking the lake, and the sunset from there was incredible! The girls! It was here that we met Rachel and Hattie and were dazzled by their ability to knock pigs unconscious purely by their prescence and to laugh so hard they made themselves ill! The lasagne. Yes, it took HOURS to come, but good lord that was fabulous! The inca ruins. On the isla del sol there are some inca ruins, and eased us into our inca journey nicely before cusco. The rain! After the first day in the gorgeous sunshine, we most definitely experienced Isla del Sol in its most impressive stormy ways. It most certainly made walking back from supper that evening interesting, and made our walk across the next day impossible. Luckily Nick and courtney were on hand to save the day and we had a Film day in our hostel! The hill to our hostel. On arrival to Isla del sol we were informed that a good hostel was a twenty five minute walk away. This would be fine if it wasn't thirty degrees, and if we hadn't had to carry our bags all the way, and if that twenty five minutes hadnt been walking straight up, and if the boy leading us to the hostel had AT LEAST pretended to be mildly out of breath as he waited for us at the top. The hill to our hostel. No, this isnt an error in repetition. On the way back to Copacabana we had saved some left over pizza to have for our bus ride to Cusco. Only I had left it on the bed in the hostel. Back up I went, and nearly expired all in the name of pizza. Which then gave me food poisoning. Hooray! 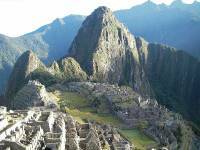 Next was on to Cusco for the much awaited Machu Picchu, and our first stop in Peru! Machu Picchu itself obviously. It really is amazing, although baffling as to why ANYONE would chose such a place to build a city! The surrounding mountains do provide a beautiful setting to the ruins though, and we had a great day learning about the history of it all. The people. It was the same crowd in Cusco as it had been in La Paz, and 'Team Bajo' was reunited once more! Also bumped into Laura and Kailash, Berrick, Johannes, Dennis, Aaron and Felicity again! The worlds highest slingshot. Team Bajo (sadly minus Gus who was being selfish and travelliing other parts of the globe by this time, but thankfully not wihtout our resident reluctant Cara) got our adrenaline kicks at the world's most budget activity park. Being fired like super man into the air on a bunjee couurd was incredible, and with the stiff necks we all came away with, most definitely a once in a lifetime experience! The Real McCoy! A restaurant run by a lady from Lancashire, who turned into our travelling mums whilst we were in Cusco! Amazing food, amazing lady, and amazing chance for Jelly to get embarassingly competitive over a game of Monopoly! On arrival at the amphitheatre, we were told that it was exactly that. An Amphitheathre, although it could possibly also have been a greenhouse or a brothel. It is understandable to see how all of those things can get confused... Perhaps. Machu Picchu Mountain. As well as walking around the ruins we decided to walk up Machu Picchus Mountain which is next to the ruins but very high and a pretty hard walk. However, the previously mentioned pizza incident was not fully out of our systems as we embarked on the walk and it ended with my being rather ill half way up. My sincere apologies to the Incas. The looks on fellow passengers faces on the train home from Machu Picchu as extreme fatigue took over Alice, Kate, Gus, Jelly and Charlie (just completed the inca trail). They got a little over excited about the prospect of going back to Cusco to a bed and spent most of the journey doing yet more animal impressions for the camera! Sorry this is getting further behind! I will try and catch up as soon as I can!